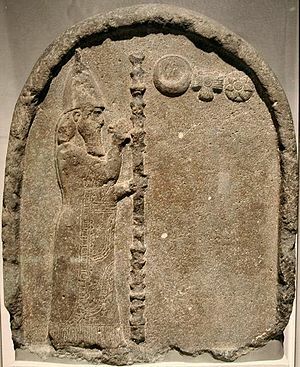 Nabonidus (/ˌnæbəˈnaɪdəs/; Akkadian: 𒀭𒀝𒉎𒌇 dNabû-naʾid, "Nabu is praised") was the last king of the Neo-Babylonian Empire, reigning from 556–539 BC. He seized power in a coup, toppling King Labashi-Marduk. Although his origins are not clear, it is understood that he was not Chaldean, like previous kings, but was a proud Assyrian, from Babylon’s rival to the north, making him unpopular during his reign. He also angered the priests and commoners of Babylon by neglecting the city’s chief god, Marduk, and elevating the moon god, Sin, to the highest status. In fact, Nabonidus left the capital for ten years to build and restore temples – mostly to Sin – leaving his son in charge. While leading excavations for the restoration effort, he initiated the world’s first archaeological work. Meanwhile, the Persian Achaemenid Empire to the east, led by Cyrus the Great, had been gaining strength. King Cyrus had become popular among the residents of Babylon by posing as the one who would restore Marduk to his rightful place in the city. As the Persians advanced to Babylon, Nabonidus returned. He was captured by the Persians in 539 BC and Babylon was occupied, thus ending the Neo-Babylonian Empire. Cyrus was welcomed into the city, where he performed the rites of Marduk. Nabonidus’ fate is uncertain, though it is believed he was exiled to Iran and allowed to occupy a government post. Modern perceptions of Nabonidus' reign have been heavily colored by accounts written well after his reign as king of Babylon, most notably by the Persians and the Greeks. As a result, Nabonidus has often been described in very negative terms in both modern and contemporaneous scholarship. However, an accumulation of evidence and a reassessment of existing material has caused opinions on Nabonidus and the events that happened during his reign to alter significantly in recent decades. Nabonidus' background is not clear. He said in his inscriptions that he was of unimportant origins. Similarly, his mother Addagoppe, who lived to an old age and may have been connected to the temple of the moon-god Sîn in Harran, does not mention her family background in her inscriptions. There are two arguments for an Assyrian background: repeated references in Nabonidus' royal propaganda and imagery to Ashurbanipal, the last great Neo-Assyrian king; and Nabonidus' originating from, and his special interest in Harran, an Assyrian city and the last stronghold of the Neo-Assyrians after the fall of Nineveh, their main capital. A few inscriptions name Nabonidus’ father, Nabu-balatsu-iqbi, satrap (governor) of Harran and descendant of Esarhaddon, though one brick inscription from Harran lists his name as “Naksu” in place of “Nabu”. Inscriptions title him as The Wise Prince and The Devotee of the Great Gods and Goddesses, however his family is never mentioned, leading to the assumption he died as a young man. 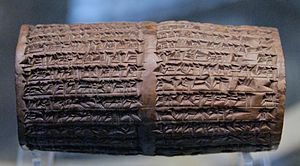 However, it has been pointed out that Nabonidus' royal propaganda was hardly different from his predecessors, while his Persian successor, Cyrus the Great, also referred to Ashurbanipal in the Cyrus cylinder. He certainly did not belong to the previous ruling dynasty, the Chaldeans, of whom Nebuchadnezzar II was the most famous member. He came to the throne in 556 BC by overthrowing the young king Labashi-Marduk. 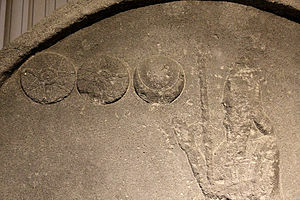 The emblems of Venus, Sun, and Moon on the Stele of Nabonidus, found at Harran (Şanlıurfa Museum). Note that Nabonidus is closest to the moon. Nabonidus took an interest in Babylon's past, excavating ancient buildings and displaying his archeological discoveries in a museum. In most ancient accounts, he is depicted as a royal anomaly. Nabonidus is supposed to have worshiped the moon-god Sîn beyond all the other gods, to have paid special devotion to Sîn's temple in Harran, where his mother was a priestess, and to have neglected the Babylonian primary god, Marduk. He left the capital and travelled to the desert city of Tayma in Arabia early in his reign, from which he only returned after many years. In the meantime, his son Belshazzar ruled from Babylon. Nabonidus is most revered and is known as the first archaeologist. Not only did he lead the first excavations which were to find the foundation deposits of the temples of Šamaš the sun god, the warrior goddess Anunitu (both located in Sippar), and the sanctuary of Naram-Sin, the moon god, located in Harran, but he also had them restored to their former glory. He was also the first to date an archaeological artifact in his attempt to date Naram-Sin's temple during his search for it. Even though his estimate was inaccurate by about 1,500 years, it was still a very good one considering the lack of accurate dating technology at the time. Although Nabonidus' personal preference for Sîn is clear, the strength of this preference divides scholars. While some claim that it is obvious from his inscriptions that he became almost henotheistic, others consider Nabonidus to have been similar to other Babylonian rulers, in that he respected the other cults and religions in his kingdom. His negative image could then be blamed on the Marduk priesthood, that resented Nabonidus' long absence from Babylon during his stay in Tayma, during which the important, Marduk-related New Year (Akītu-) Festival could not take place, and his emphasis on Sîn. In any case, there is no sign of the civil unrest during his reign that would have been indicative of trouble. Granite stele of the Babylonian king Nabonidus. Ancient Orient Museum, Istanbul Archeological Museums,Turkey. It is not clear yet why Nabonidus stayed in Tayma for so long. His reason for going there seems clear: Tayma was an important oasis, from where lucrative Arabian trade routes could be controlled. The Assyrians before him had already attempted to do the same. However, why Nabonidus stayed for so long (probably about ten years, perhaps from 553–543 BC) and why he returned when he did remain unresolved questions. It has been proposed that this was because he did not feel at home in Babylon, which was opposed to his emphasis on Sîn. Regarding his return, this may have had to do with the mounting threat of Cyrus and growing disagreements with Belshazzar, who was relieved of his command directly after Nabonidus had come back, along with a number of administrators. During his stay, Nabonidus adorned Tayma with a complex of royal buildings, most of which have come to light during recent excavations. Different accounts of the fall of Babylon survive. According to the Cyrus Cylinder, the people opened their gates for Cyrus and greeted him as their liberator. Isaiah 40–55 prophesied that the Persians would carry off Babylonian women and cultic statues. Herodotus said that Cyrus defeated the Babylonians outside their city, after which a siege began. When this took too long, Cyrus diverted the Euphrates, so that his troops could march into the city through the river bed. Xenophon had a similar view, but he did not mention the battle. Finally, Berossus claimed that Cyrus beat the Babylonian army but, this time, Nabonidus was supposed to have fled to nearby Borsippa. There he hid, while Cyrus took Babylon and demolished its outer walls. When Cyrus turned towards Borsippa, Nabonidus soon surrendered. "In the month of Tašrîtu, when Cyrus attacked the army of Akkad in Opis on the Tigris, the inhabitants of Akkad revolted, but he massacred the confused inhabitants. The fifteenth day [12 October], Sippar was seized without battle. Nabonidus fled. The sixteenth day, Gobryas [litt: Ugbaru], the governor of Gutium, and the army of Cyrus entered Babylon without battle. Afterwards, Nabonidus was arrested in Babylon when he returned there. Till the end of the month, the shield carrying Gutians were staying within Esagila but nobody carried arms in Esagila and its buildings. The correct time for a ceremony was not missed. In the month of Arahsamna, the third day [29 October], Cyrus entered Babylon, green twigs were spread in front of him - the state of peace was imposed upon the city. Cyrus sent greetings to all Babylon. Gobryas, his governor, installed subgovernors in Babylon." This left the Babylonian army in an untenable position and it soon surrendered. In the meantime, Ugbaru, the commander of the Persian forces that had captured Babylon, had taken good care that his men should not plunder or otherwise harm the city. He had even made sure that the temple rites continued to be observed. Nonetheless, it still took Cyrus almost a month before he proceeded towards the city. As many Babylonian officials as well as the Babylonian administrative system stayed in place after the transition of power, it has been surmised that this time was spent on negotiations with representatives from the city; this is similar to what happened when the Neo-Assyrian king Sargon II and later Alexander the Great took the city. The final fate of Nabonidus is uncertain. Cyrus was known to spare the lives of some kings he had defeated, for example King Croesus of Lydia, who, after his defeat, was allowed to live at King Cyrus's court as an advisor. This is according to Herodotus, who also states that Croesus was first sentenced to death by burning and was only allowed to live after showing his wisdom. 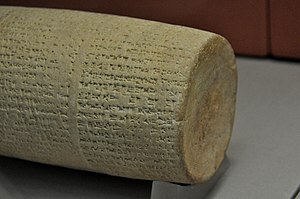 In the reference in the Nabonidus Chronicle to a campaign by Cyrus in (possibly) 547 BC, during which a country was taken and its king killed, the text showing the name of the country is damaged, although it may be Urartu. Accounts by Berossus and the retrospective Hellenistic Babylonian dynastic prophecies state that he was allowed to retire to live in Carmania. ↑ Dougherty 2008, p. 43. ↑ See for example in W. von Soden, “Kyros und Nabonid: Propaganda und Gegenpropaganda”, in H. Koch and D.N. MacKenzie (eds. ), Kunst, Kultur und Geschichte der Achämenidenzeit und ihr Fortleben (Berlin: Dietrich Reimer 1983), 61–8; P.-A. Beaulieu, The reign of Nabonidus king of Babylon 556-539 B.C. (New Haven CT: Yale University Press 1989); A. Kuhrt, “Nabonidus and the Babylonian priesthood”, in M. Beard and J. North (eds. ), Pagan priests: Religion and power in the ancient world (London: Duckworth), 117-55; F. Grant, “Nabonidus, Nabû-šarra-uṣur, and the Eanna temple”, in Zeitschrift für Assyriologie 81 (1991:37–86); T.G. Lee, “The jasper cylinder seal of Aššurbanipal and Nabonidus’ making of Sîn’s statue”, in Revue d’Assyriologie 87 (1993:131-6); P. Machinist and H. Tadmor, “Heavenly wisdom”, in M.E. Cohen, D.C. Snell and D.B. Weisberg (eds. ), The tablet and the scroll: Near Eastern studies in honour of William W. Hallo (Bethesda MD: CDL Press 1993), 146–51; H. Schaudig, Die Inschriften Nabonids von Babylon und Kyros’ des Großen samt den in ihrem Umfeld entstandenen Tendezschriften: Textausgabe und Grammatik (Münster: Ugarit-Verlag 2001); P.-A. Beaulieu, “Nabonidus the mad king: A reconsideration of his steles from Harran and Babylon”, in M. Heinz and M.H. Feldman (eds. ), Representations of political power: Case histories from times of change and dissolving order in the ancient Near East (Winona Lake IN: Eisenbrauns 2007), 137–66. ↑ W. Mayer, "Nabonidus Herkunft", in M. Dietrich and O. Loretz (eds. ), Dubsar anta-men: Studien zur Altorientalistik (Münster: Ugarit-Verlag 1998), 245–61; Parpola, Simo (2004). "National and Ethnic Identity in the Neo-Assyrian Empire and Assyrian Identity in Post-Empire Times" (PDF). Journal of Assyrian Academic Studies. JAAS. 18 (2): 19. Similarly: Parpola, Simo. "Assyrians after Assyria". University of Helsinki, The Neo-Assyrian Text Corpus Project (State Archives of Assyria). ↑ Wolfgang Röllig: Erwägungen zu neuen Stelen König Nabonids. In: Zeitschrift für Assyriologie und Vorderasiatische Archäologie. Band 56, 1964, S. 218–260, hier S. 237. ↑ A. Kuhrt, "'Ex oriente lux': How we may widen our perspectives on ancient history", in R. Rollinger, A. Luther and J. Wiesehöfer (eds. ), Getrennte Wege? Kommunikation, Raum und Wahrnehmung in der alten Welt (Frankfurt am Main: Verlag Antike 2007), 617–32. ↑ Beaulieu 1989:46–65; Machinist/Tadmor 1993. ↑ Beaulieu 1993; A. Kuhrt, "The Cyrus cylinder and Achaemenid imperial policy", Journal for the Study of the Old Testament 25 (1983:83–97). ↑ Beaulieu 1989:149–205. On Tayma's importance for trade: C. Edens and G. Bawden, "History of Tayma' and Hejazi trade during the first millennium B.C. ", Journal of the Economic and Social History of the Orient 32 (1989:48–103). ↑ An overview of the history of Tayma, current archaeological work, as well as bibliographical references, are given in "Deutsches Archäologisches Institut: Tayma". Archived from the original on 2007-10-23. Retrieved 2007-10-16. Also: H. Hayajneh, "First evidence of Nabonidus in the Ancient North Arabian inscriptions from the region of Tayma", Proceedings of the Seminar for Arabian Studies 31 (2001:81–95). ↑ From the Babyloniaca: Fragmente der griechischen Historiker 680F9a = Flavius Josephus, Against Apion 1.149–153. ↑ P. Briant, From Cyrus to Alexander: A history of the Persian Empire (Winona Lake IN: Eisenbrauns 2002), 50–5, 80–7; G. Tolini, " "Quelques éléments concernant la prise de Babylon par Cyrus (octobre 539 av. J.-C.)" (PDF). ", Arta (2005/03); A. Kuhrt, " "Ancient Near Eastern history: The case of Cyrus the Great of Persia" (PDF). ", in H.G.M. Williamson (ed. ), "Understanding the history of ancient Israel". (Oxford: Oxford University Press 2007), 107–27. ↑ J. Wiesehöfer, "Kontinuität oder Zäsur? Babylon under den Achaimeniden", in J. Renger (ed. ), Babylon: Focus Mesopotamischer Geschichte, Wiege früher Gelehrsamheit, Mythos in der Moderne (Saarbrücken: SDV 1999), 167–88; M. Jursa, "The transition of Babylonia from the Neo-Babylonian empire to Achaemenid rule", in H. Crawford (ed. ), Regime change in the ancient Near East and Egypt: From Sargon of Agade to Saddam Hussein (New York: Oxford University Press 2007), 73–94. ↑ J. Oelsner, "Review of R. Rollinger, Herodots babylonischer logos: Eine kritische Untersuchung der Glaubwürdigkeitsdiskussion (Innsbruck: Institut für Sprachwissenschaft 1993)", Archiv für Orientforschung 46/47 (1999/2000:378-80); R. Rollinger, "The Median "empire", the end of Urartu and Cyrus' the Great campaign in 547 B.C. (Nabonidus Chronicle II 16)", Ancient West & East 7 (2008:49–63).